This weekend, September 10-12, over 150 of the nation’s best rifle, shotgun and pistol shooters will compete at the U.S. 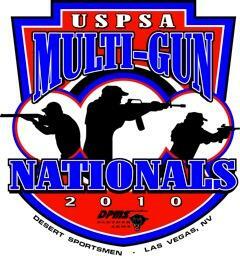 Practical Shooting Association’s 2010 Multi-Gun National Championships. The event is hosted at the Desert Sportsman’s Rifle & Pistol Club , on the west side of Las Vegas, NV. Your Editor will be on hand to report on the action. The USPSA Multi-Gun Nationals will feature 12 challenging stages involving rifle, shotgun, and pistol. The action is fast, demanding speed AND accuracy. National Titles will be decided in multiple USPSA Classes: Open, Limited, Tactical, Heavy Metal Limited, and Heavy Metal Tactical divisions. Honors will also be awarded in the categories of High Lady, Senior, Super Senior, Junior, Military & Law Enforcement. Share the post "USPSA Multi-Gun Nationals Begin September 10 in Las Vegas"
This fall, the NRA is releasing a definitive, 575-page history of the National Matches. The $59.95 book, entitled The National Matches: 1903-2003 The First 100 Years covers all the National Match venues, starting with New Jersey’s Sea Girt, followed by Creedmoor in New York, and finally the present-day home at Camp Perry, Ohio. Richly illustrated with hundreds of photos, this special Collectors’ Edition includes National Match facts, complete National Match results, and notable shooter histories. The book also covers the evolution of match rifles and pistols over the past century. Any shooter who has competed at the National Matches, or who has an interest in National Match history, should consider adding this book to his personal collection. The National Matches: 1903-2003 The First 100 Years will soon be available for purchase from the NRA Program Materials Center, item number CC19740. Share the post "New 575-page History of the National Matches (Fall Release)"